This chamber organ was made by Robert Gray in 1775, his earliest surviving instrument. Robert Gray insured premises at Leigh Street near Red Lion Square on December 17th 1772 (Joan Jeffrey from the Sun Fire Insurance policy registers). He later went into partnership with his brother William in around 1790 (the date of the chamber organ at Burghley House). William’s son John became one of the finest builders of his day, and went into partnership with Frederick Davison to form the firm of Gray & Davison. The early history is unknown. 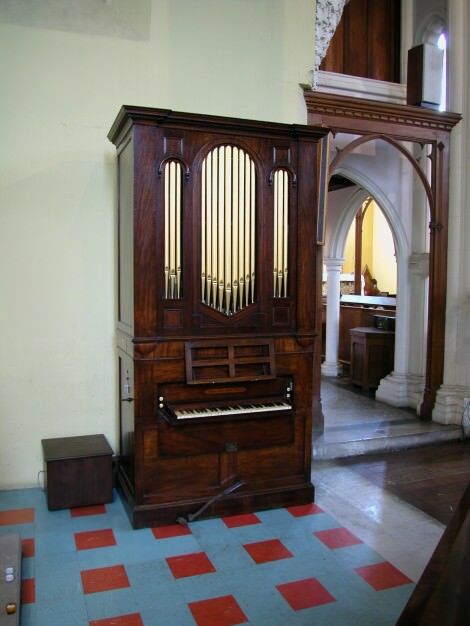 In 1848 the organ was restored, with a new pipe front added, by Bates of Ludgate Hill, when it was purchased by the Refuge for the Destitute, Hackney Rd, Dalston, for £55. It was given to St James in 1923, and has stayed there ever since. The organ’s future was saved by the Vicar in the 1970s, when it was brought back into use. The 2002 restoration by Edward Bennett, Verners Kalacis and Christina Reinspach was carried out on the initiative and through the efforts of Victoria Hay, sometime organist of the church. The shifting movement reduces the stops sounding to Diapasons. The pipes have a very low mouth height, and have a correspondingly gentle sound. Their condition is fragile, so it was decided to keep the tuning slides, the pitch therefore remaining at A440, but using the tuning system surviving at Burghley House, a modified 1/6 comma meantone.